History, Characteristics, Mentuhotep's Mortuary Temple. Eleventh Dynasty of Ancient Egypt. The Middle Kingdom started when Nebhepetre Mentuhotep II reunified Upper and Lower Egypt, paving the way for a second Renaissance of Egyptian art. Thebes emerged as a major town for the first time, serving as both capital and artistic center during the Eleventh Dynasty. The first great example of Egyptian architecture of the period was was Mentuhotep's mortuary complex, loosely based on the tombs of his Theban ancestors. Constructed against the spectacular sheer cliffs of western Thebes, its central feature was a terraced temple with pillared porticoes. Its decorations included a range of painted relief sculpture, carved in a distinctive Theban style, which are now considered by scholars to be among the finest ever produced in Ancient Egypt. 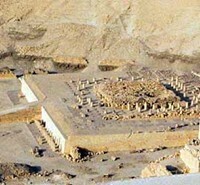 After the Eleventh Dynasty, the new Pharaoh Amenemhet I, relocated the capital to Itj-tawy, near modern-day Lisht. Inspired by the Egyptian sculpture which decorated a number of nearby Old Kingdom monuments, the artists of the Twelfth Dynasty set about creating a new set of aesthetics, exemplified by a series of architectural royal statues. The collapse of the Old Kingdom was followed by a lengthy period of turmoil and internal disorder, during which no monumental buildings were erected. About 2050 BCE Nebhepetre Mentuhotep, a member of one of the princely houses of Thebes, succeeded in reuniting the Two Kingdoms. Thebes became temporarily the royal capital. On the east bank of the Nile, near the principal sanctuary from which later grew the temple complex of Karnak, lay the city with its palace, administrative buildings, and residential quarters. On the opposite (west) bank the dead had been buried since time immemorial at the foot of the impressive cliffs. King Mentuhotep, founder of the Middle Kingdom, chose for his mortuary temple and burial place the edge of a valley leading into these western cliffs and ending in a sheer wall of solid rock (Deir el Bahari). This deep basin was probably already sacred to Hathor, goddess of the dead. 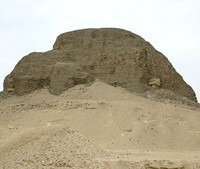 Mentuhotep's mortuary temple is the first known monumental building in Upper Egypt and in Thebes. As a royal tomb and centre for the worship of the king and the Theban gods, it had to give prominence to the new dynastic order under the leadership of Thebes. The fabric of the temple has suffered severely from subsequent exploitation as a stone quarry and from rockslides. The design was strongly axial, leading from the edge of the fertile land to the tomb chamber of the king deep within the cliff. The facade faced east, toward the sanctuary of Karnak, where the cult of Amon can be traced back to the rise of Thebes. As in the royal mortuary complexes of Memphis, here too a valley temple (not preserved) gave access to a walled causeway that ascended to a broad walled court, terminating in the temple area abutting the western cliff. The final stretch of the approach to the temple was flanked by sycamores and tamarisks. The temple itself stood on a raised terrace carved from the living rock; access from the court was by a massive central ramp. The base of the terrace was fronted with double porticoes on either side of this ramp. On the terrace was a broad freestanding building, square in plan, and upon it an elongated structure that extended west into the cliff side. The square structure had a massive core with sloping walls, pillared galleries ("ambulatories") on all four sides, and an outer ring of thick battered enclosing walls. Like the east face of the terrace, these walls were fronted by porticoes on east, north, and south. The openness of this architecture probably goes back to the earlier Theban princely tombs. See also: Mesopotamian Art (c.4500-539 BCE). The western part of the temple was primarily dedicated to the worship of the dead ruler. Here was the entrance to the tomb chamber, in the floor of a small columned court that separated the "fore-temple" from the mortuary temple proper. The latter consisted of a wide hall, whose flat roof was supported by ten rows of eight columns, the oldest known Egyptian hypostyle hall of any size in the history of architecture. The holy of holies was a rock-cut chamber opening off the west side of this hall. The design of the mortuary temple of King Mentuhotep is one of the most independent in Egyptian architecture. Since it was first discovered the assumption has been that the massive core structure at the east end of the terrace was once topped by a pyramid that rose above the flat roofs of the ambulatories and the outer walls, and this is the reconstruction found in all the histories of ancient art and architecture. Only recently, through the efforts of D. Arnold, has the underlying religious and lordly conception of the temple become apparent. According to Arnold, the core structure is a reflection of a primitive sanctuary excavated beneath the Monthu temple of Medamud (near Thebes), interpreted as the primeval abode of the deity Monthu-Ra worshipped in the Theban region and thus as a monumentalized "primeval hill." In the exercise of his authority on earth and in death the king had close ties with this local creator god. Mentuhotep's hypostyle hall carved out of the western cliff was devoted to the cult of the king, living and dead, and of the god Amon-Ra of Karnak; this is the first hint of the intimate relationship between the ruler and Amon-Ra that was to play so large a part in the New Kingdom mortuary temples at Thebes. Beneath the core structure lies the dummy tomb of the king, reached from the forecourt (Bab el Hosan), an Osiris tomb with which the plantings in the court were presumably related. The statues of the king in long festive robes, found in the broad temple courtyard, signify the earthly and eternal celebration of his royal jubilee and the perpetual rebirth of the ruler and the dynastic order that he embodied. In Arnold's interpretation, which is consistent with the surviving fragments of the wall reliefs, Mentuhotep's mortuary temple was newly shaped by a theology and a conception of kingship that had developed from local Theban traditions. It was a unique creation representing influences that emerged in modified form in the terracing of the Twelfth Dynasty princely tombs of Qaw el Kebir and, some five hundred years later, in Hatshepsut's temple complex, its close neighbour to the north. The kings of the Twelfth Dynasty also came from Thebes, but for political reasons they transferred their residence back to Memphis. At the same time they retained a particular affection for Thebes and adorned the nome with temples; after Memphis, Thebes became the most important religious centre. 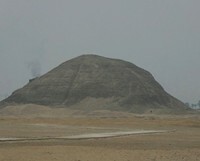 South of Memphis, near Lisht and Dahshur, and farther south at Lahun and Hawara, on the edge of the Fayum basin (an area that the kings of the late Twelfth Dynasty opened up for farming), lie the royal tombs built again by Egyptian architects in accordance with Memphite tradition, in the form of pyramids with mortuary temples. Only the tomb monument of Sesostris I near Lisht has enough architectural and sculptural remains to permit a plausible reconstruction. The plan of the mortuary temple is reminiscent of the pyramid complexes of the later Old Kingdom during the Sixth Dynasty. The Egyptian pyramids of the Old Kingdom have neither the height nor the solidity of those built of squared stone blocks in the Old Kingdom. The position of kingship had changed, and confidence in the massiveness of tombs as a means of ensuring the continuance of eternal existence had been shaken by the political upheavals of the First Intermediate Period; also social changes had occurred that meant the labour resources of the entire country were no longer at the disposal of the Twelfth Dynasty kings. Amenemhat I, founder of the Twelfth Dynasty, plundered the mortuary temples of Cheops and other kings of the Old Kingdom for granite blocks to build his own pyramid. (See also: Imhotep, the greatest Old Kingdom architect.) All the pyramids of this period exhibit new techniques that are saving of both labour and materials. Their cores consisted either of sand and rubble, the mass held together by a radiating system of rubble walls, or entirely of sun-dried brick. Only the outer sides of the pyramids were carefully faced with white limestone slabs, and the apex was sometimes of dark granite. On the other hand, as compared with the Old Kingdom, greater resources were diverted toward safeguarding the royal tomb itself by the most solid possible construction for the sarcophagus chamber, sometimes hollowed from an immense monolith, and by blind corridors to defeat tomb robbers. The most important of the mortuary temple complexes, that of Amenemhat III at Hawara, was known to the Greeks as the "labyrinth." Herodotus (Histories, II, 148) and Strabo (Geography, XVII, 1, 37) are among the ancient authors who have left descriptions of this enormous structure, of which almost nothing now remains. Attempts to reconstruct it exclusively on the basis of these accounts have been only partially successful. Apart from its kings, the Twelfth Dynasty also had its feudal nobility, the princely families of Middle and Upper Egypt who constituted an influential and largely independent power. Near their provincial capitals on the gently or steeply sloping flanks of the hills that fringed the Nile Valley they also built rock tombs, some of which vied in lavishness, and independence of design with the mortuary complexes of the kings. Because of their excellent state of preservation they add greatly to our understanding of the tomb architecture of the period. 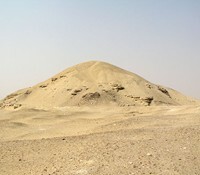 The rock tombs at Beni Hasan in Middle Egypt reflect the Lower Egyptian concept of the tomb as a representative eternal "abode" and "residence" of the dead. The rock chamber of one of the older tombs is furnished with papyrus-bundle columns, and represents a "festival hall" that may have existed - built of less permanent materials - in the palaces of the princes. The entrances often lie beneath an open porch of a kind also found in the contemporary houses of the nobility. In the later princely tombs at Beni Hasan a stricter emphasis on cult requirements and royal prototypes produced a deep, axially oriented, three-aisled rock chamber. The sections of ceiling between the longitudinal architraves are flat vaults, and rest on polygonal pillars; exactly opposite the entrance in the rear wall of the middle aisle stands a niche containing the statue of the owner of the tomb. The vaulted ceilings over the three aisles are painted with elements characteristic of the tentlike festival halls, colourful carpet patterns and wooden ribs, whose perishable counterparts have not survived. See also: Egyptian Colour Palette. Upper Egyptian ideology, on the other hand, corresponds to the abstraction of architectural forms, and serves only the ceremonial fulfillment of the cult along a strong axially directed spatial sequence. The tomb of Prince Sirenpowet II on the west bank near Aswan is a grandiose example of the axial plan oriented strictly east and west. From the lofty three-aisled entrance hall, with its flat ceiling and square pillars, one continues westward over low steps that lead to a long passageway with a low-vaulted roof, ending in the cult chamber. The floor of this passageway sinks by imperceptible degrees to permit sunlight to pass through the tall entrance door into the cult chamber and fall on the richly painted sanctuary with the statue of the deceased. In their architectural plan, the most highly developed of the princely tombs are those at Qaw el Kebir (east bank, south of Assiut). From a broad columned forehall built of brick at the foot of the hill a covered causeway led up to the mortuary complexes; these are in many stories that overlap the slopes, and through open stairways the cliff spaces are linked with screened forecourts, pillared halls, and sanctuaries in wide hollowed-out halls. This is the articulation of the royal mortuary temple adapted to the exigencies of a hillside site. The resemblance, moreover, is not merely external; the thematic correspondence of the sequences of rooms and the furnishings with those of the royal tombs extends even to the details. From the Middle Kingdom there are more important remains of temples than from the Old Kingdom. They were frequently, even in the Twelfth Dynasty, still constructed of brick, and through later renovations in stone their remains, though widely scattered throughout the land, are scanty indeed and often insufficient to permit an intelligible reconstruction of the plans. Nonetheless, it is clear from the little that survives that the architecture of the Middle Kingdom put into effect certain new ideas that were to have a decisive influence on the future organization of the sanctuaries of the gods. One might mention the sanctuaries that now appeared for the first time in temples in the neighbourhood of Thebes, at Medamud (northeast of Karnak) and Tod (south of Luxor): these had closing doors at front and rear and were approached through a broad hall of pillars or columns. They served, like later examples from the Eighteenth Dynasty, as permanent or temporary repositories for the images of the gods and their barges, and indicate that these images were carried in procession to other sanctuaries inside and outside their own temple. An unusual feature of the small temple built by Amenemhat III and IV on the edge of the Fayum at Medinet Madi is the antechamber supported by two papyrus-bundle columns between side walls extended to the front to protect the entrance. Inside, the arrangement of the three shrines for the statues of the gods honors a tradition going back to the time of the pyramids. See also: Greek Architecture (900-27 BCE). The two-towered "pylon," (see Architecture Glossary) so characteristic of the monumental entrances of the walled temples after the beginning of the New Kingdom, has its origins in the Middle Kingdom, as excavations at Hermopolis have shown. The pylon towers were probably the end result of a process of thickening and raising the front walls of large courts on either side of a lower entrance gate. The gate towers ("pylons") have battered walls on all sides, beaded fillets at the corners, and an encircling concave cornice at the top. In the front walls are narrow recesses, varying in number, and on holidays these contained tall masts with colourful pennants. The masts were steadied by wooden braces projecting from narrow window openings high above the recesses. Inside the pylons stairs led to the upper rooms and the flat roof. Between the two gate towers was sandwiched the lower main portal of the temple, also crowned with a concave cornice. In late texts the pylons are designated as the "hills of the horizon," between which the sun rises. The late identification of the two gate towers with the goddesses Isis and Nephthys probably derives from the mythological concept that these two goddesses bear up the rising sun in their arms. The pylons give the temple facade and its entrance portal a strong accent and unique monumentality. At the same time, their fortress-like aspect clearly expresses the idea of the defense of the temple entrance against all hostile powers. Accordingly, from the Nineteenth Dynasty on, the kings recorded their victorious battles, or the god's bestowal of a victory-promising weapon, in stone sculpture (reliefs) on the outer walls of the pylons. Against the two narrow sides or the rear of the pylons abutted the walls that enclosed the temple. In the New Kingdom paired obelisks were often erected in front of the pylons, one on either side of the temple entrance. A single obelisk, originally symbolizing the resting place of the sun god, was first erected of limestone blocks in the Fifth Dynasty sun sanctuaries. (See also: Megalithic Art.) Since the Old Kingdom the centre for the worship of the sun god Ra (or Re) had been the sanctuary at Heliopolis, the site of the "primeval hill" with the benben stone, which had established the pattern for the Old Kingdom sanctuaries of the sun. At the beginning of the Twelfth Dynasty Sesostris I had a rectangular temple built over the low roundish sacred primeval hill of Heliopolis. Of this building one of the two sixty-five-foot rose-granite monolithic obelisks that once flanked the main entrance is all that still stands. This pair of obelisks also suggests an entrance portal between gate towers, of which, however, nothing at Heliopolis has survived. Excavations there have merely established the east-west orientation of the temple and an avenue of sphinxes that led from the bank of the Nile to the main gate. (See also: Megaliths.) A few clues to the former appearance of Heliopolis, this important sanctuary and theological centre, are supplied by the fragments of a stone tablet of the seventh century BCE, now in the Museo Egizio in Turin, bearing traces of an incised temple plan. The reconstruction shows an axial succession of three courts, each entered through a portal between gate towers. Tall flagpoles rise above the pylons of the first court, while those of the third court may have been preceded by a pair of obelisks. In the second court pillared galleries are indicated along the side walls; an adjacent sanctuary on the right has been included in the court for lack of space at the right edge of the tablet. In the third court a transverse row of pillars cuts off a narrower area in the front where, against the side wall on the right, a mighty altar is built, reached by two short flights of steps. Open courts entered through a portal between gate towers are also characteristic of the temple of Karnak, dedicated to Amon-Ra, whose expansion dates from the beginning of the New Kingdom. This is particularly true of the core of the sanctuary, which Tuthmosis I enclosed with walls, and of the south axis of the temple developed by his successors. An altar in an open court for the worship of the Heliopolitan sun god Ra-Harakhte has been preserved on the north side of the upper terrace of Queen Hatshepsut's temple at Deir el Bahari; there was another at Karnak. The sanctuary of Heliopolis was most faithfully copied under Amenhotep IV (Akhenaten), introducer of the exclusive cult of the day star (Aten), in the Aten sanctuary at Karnak and, above all, in the Aten temples, of the new capital Akhetaten (Tell el Amarna). An early Twelfth Dynasty sanctuary, richly adorned with delicate reliefs, was dismantled into blocks and used as fill in the building of the third pylon of the temple of Karnak. The parts have since been fully reconstructed; it is the "White Chapel" of Sesostris I, which the king built on the occasion of his jubilee for Amon of Thebes and Min of Coptos, the fertility god assimilated by Amon. This almost square pavilion stands on a low podium accessible at either end by ramps between low stairsteps. The building rests on four angle pillars with round fillets at the outer corners, and on two intermediate pillars on each side; these support architraves and a flat roof crowned with a concave cornice. Between the pillars the spaces, except for the two entranceways, are bridged by low parapets rounded on top. Inside, a small rectangular space is formed by four pillars, and in the centre is a granite pedestal on which stood an image of the king or the god. The "white Chapel" may be regarded as the oldest surviving example of a "baldachin temple," representing in stone and in monumentalized forms the ancient shrine beneath an awning. The Middle Kingdom also shows the first appearance of "Osiris statues" in an architectural context. In these the ruler is portrayed in a standing position, entirely swathed in a close-fitting garment that even covers the feet and leaves only the hands free to clasp the sceptres in a crossed position over the breast; Osiris, the god of death, is similarly portrayed in his cult images and other representations. At the mortuary temple of Sesostris I at Lisht such approximately lifesize statues flanked the probably unroofed approach to the temple, and thus they represented the king, with the crown of Upper or Lower Egypt on his head, as Osiris "risen." A colossal statue of the same king and the same type stood within the temple precinct of the god Osiris at Abydos; it was probably propped against a pillar and belonged as architectural sculpture to an open court of that temple. In the New Kingdom, after the beginning of the Eighteenth Dynasty statues on the same colossal scale appeared in front of interior walls, or before pillars of open halls around the wider courts, to provide architectural accents as well as to illustrate the functions of the building. They relate to the jubilee festival that the king usually celebrated at the end of the 30th year of his reign - that is, as an aging ruler. In these ceremonies were renewed the king's powers over the stage of a ritual death as Osiris, to permit his rebirth as Horus. The architecture of the Middle Kingdom contributed many new forms to the design of sanctuaries, despite the paucity of its remains, and these the much more important architecture of the New Kingdom was quite willing to exploit. See also: Greek Sculpture, an art form greatly influenced by Egyptian expertise in stone masonry, and Roman Architecture (400 BCE - 400 CE). We gratefully acknowledge the use of material from the compelling work Ancient Architecture (Electra, Milan, 1972): an essential work for students of Ancient Egyptian architecture, not least because of its powerful photographs of the interiors of pyramids and temples.  For more information about the evolution of ancient architecture, see: Homepage.